"The A–Z of Conductors surveys the history of recording during the twentieth century, from the earliest days of capturing orchestral music on disc to the present era of the iPod, through the biographies of 310 of the most significant conductors whose art is preserved on record. In addition, the entry for each conductor contains a list of selected recordings and a career outline. Four accompanying CDs present excerpts from recordings by forty-eight of the conductors featured. The A–Z of Conductors will be of interest and value both to those new to orchestral music on record who wish to explore the huge resources of repertoire and performance available, as well as to seasoned collectors. 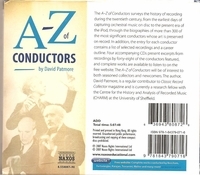 The A–Z of Conductors includes an authoritative text by David Patmore, 976 pages with a plethora of interesting factual information, many rare photographs and, most important, informed critical biographical essays on numerous conductors who up until now have been familiar only to specialist collectors….I’ve already spent countless happy hours perusing the book’s well researched and well written contents….The book alone is worth the set’s very modest asking price."